Happy Sunday! I have a super easy recipe for you that looks so much more difficult to make than it actually is. 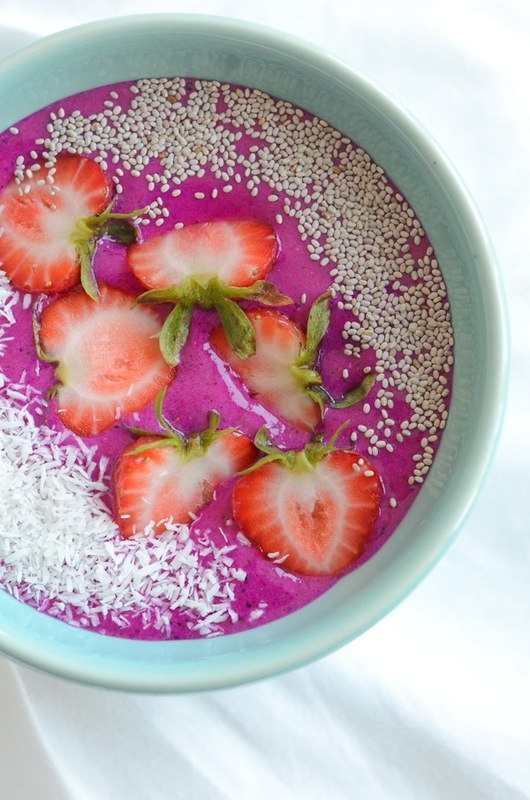 The naturally bright pink color with an assortment of your favorite toppings makes this beautiful Strawberry Pitaya Smoothie Bowl Recipe look gorgeous. Impress your friends. Heck, impress yourself! Treat yourself! 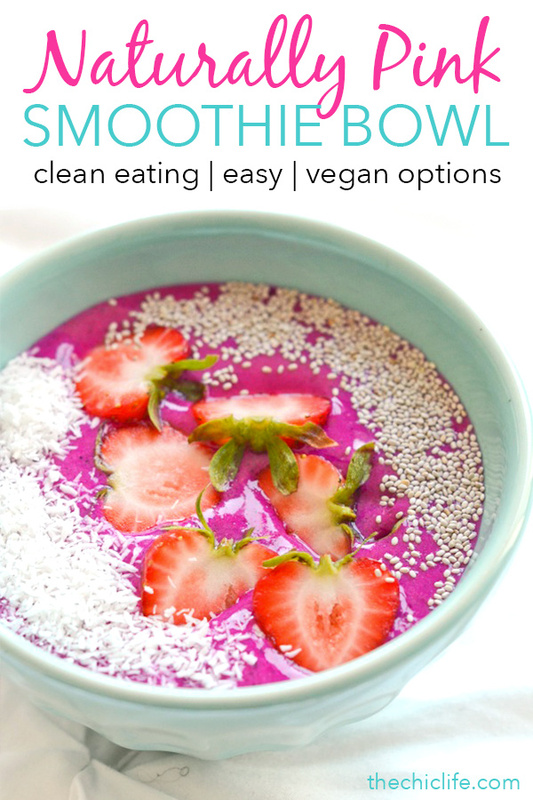 And make this Healthy Strawberry Pitaya Bowl Recipe…. 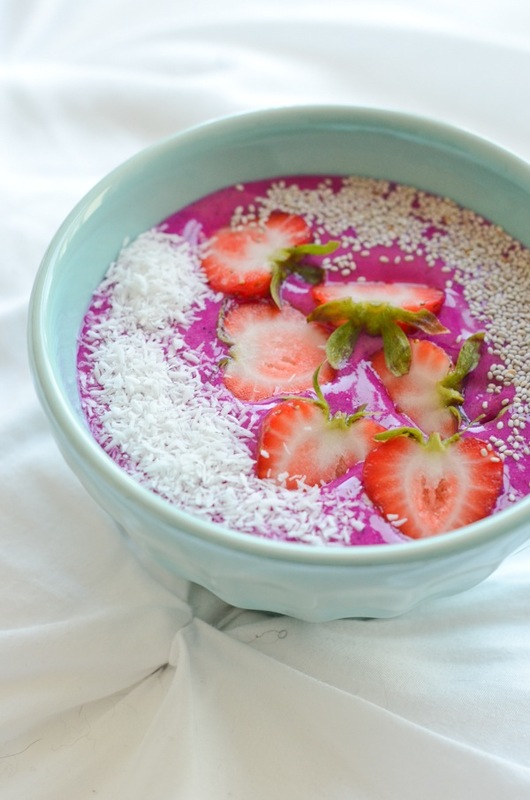 Hello, bowl of beautiful nutritional goodness. The star ingredient is this packet of pitaya purée. Pitaya is another name for dragon fruit. It comes in three colors: white, yellow, and hot pink. The fruit itself can be hard to find in stores. Lucky for you, you can easily find the puréed fruit packets in most health food stores. I found this 4-pack of Pitaya Plus at Whole Foods in the frozen section near the other frozen fruit. 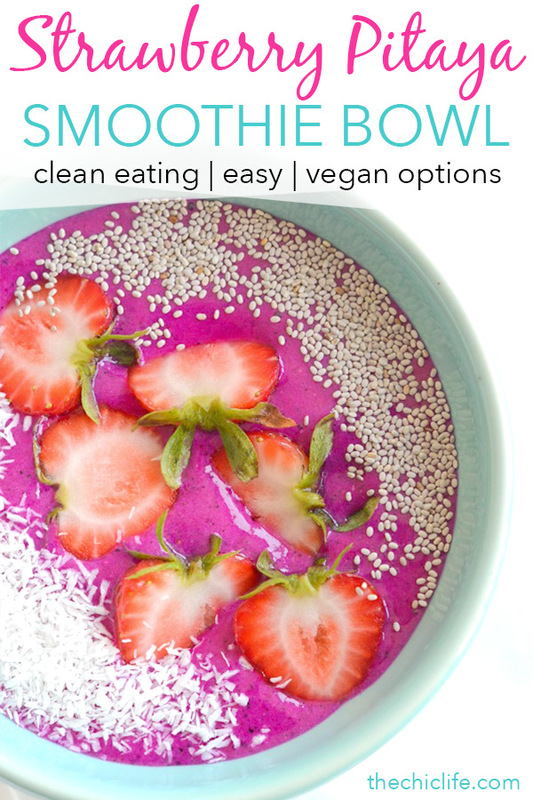 It’s usually next to the acai packets, which you can use to make this easy Acai Bowl Recipe for a similar treat. 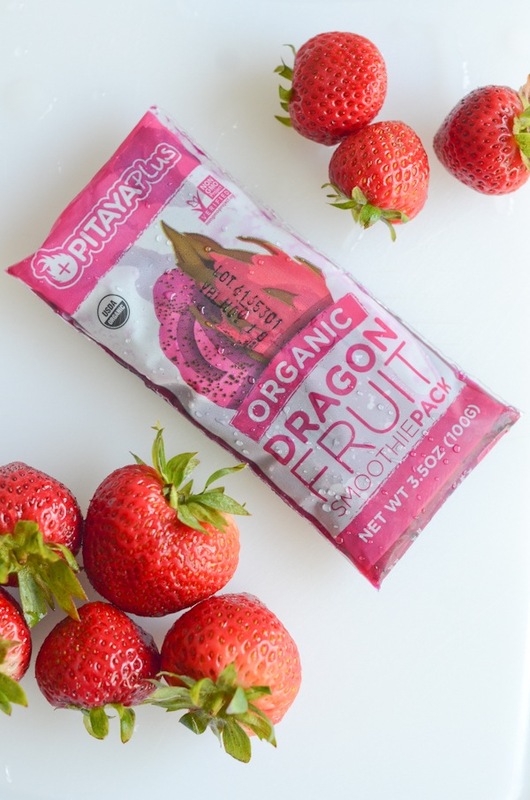 I like Pitaya Plus because it’s organic and non-GMO. Note: Ninja gifted me this blender, but I was actually planning to buy it before they did. You can read about why I like it on this post (click). You could of course add any other number of ingredients, but I like to keep things fairly simple. I’m still working on that blog post about collagen peptides. I want to make sure it’s well researched and has great details before sharing it with you guys. But if you’re already into collagen peptides, this is a great recipe for them. If you’re not sure what they are, the collagen peptides are the white powder in the blender photo above. And I’ll tell you more about them when I have that blog post ready. 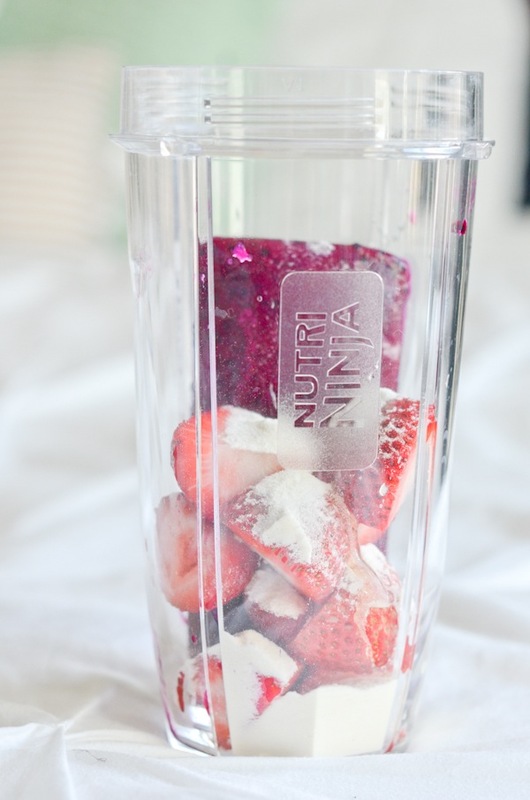 Tip: I added the collagen peptides before blending the fruit up. But this caused them to stick in a big clump in the bottom. The next time, I blended the fruit first and then added the collagen peptides. This worked so much better, so I definitely recommend this order. I’m the kind of person who likes to do things in as few steps as possible, but this added step is worth it. Tip: for steps 3 and 4, I like to pour the ingredient into my hand and use my fingers to sprinkle each evenly. 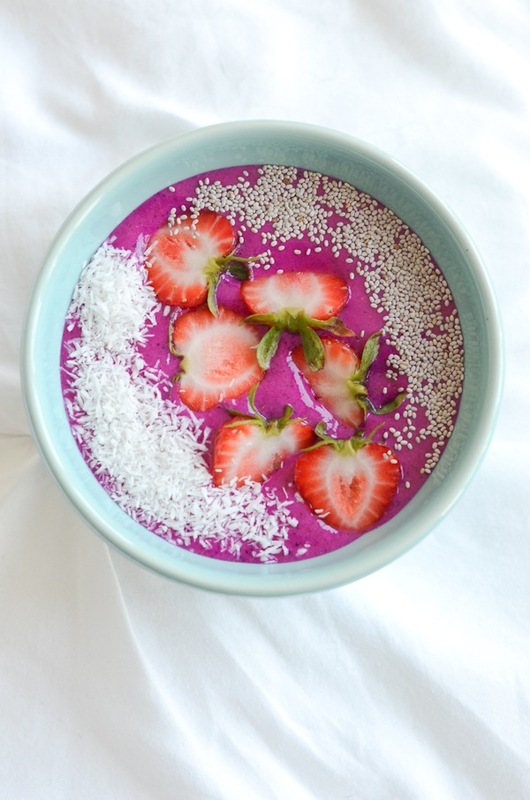 This Healthy Strawberry Pitaya Bowl Recipe is a surprisingly easy way to impress your friends and/or treat yourself to something that is as good for you as it looks. 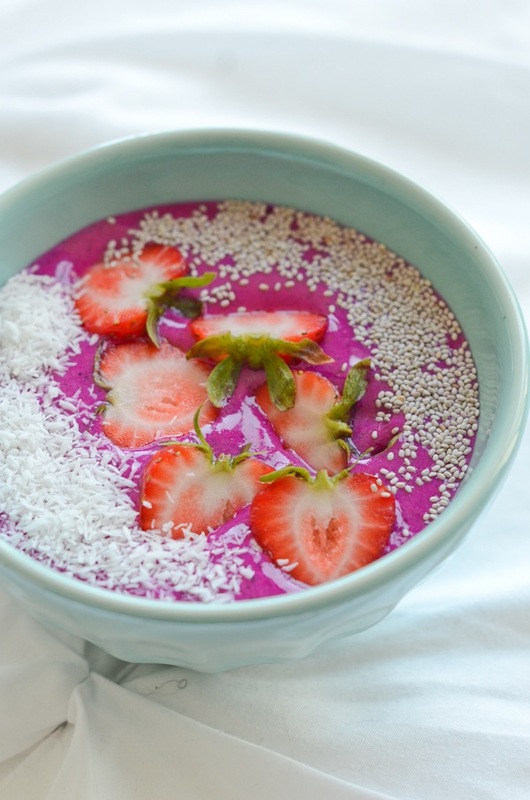 In your blender container, add pitaya, strawberries, almond milk, and honey. Blend until smooth, adding additional almond milk if needed to get the mixture to blend (about 2-3 minutes). Taste test and add additional honey, if needed. Pour into a bowl. Place strawberry halves down the middle of the bowl. Sprinkle coconut flakes on one side. Sprinkle chia seeds on the other. Enjoy! Tip: Run the unopened pitaya packet under water (cool is fine) to loosen it from the packaging. 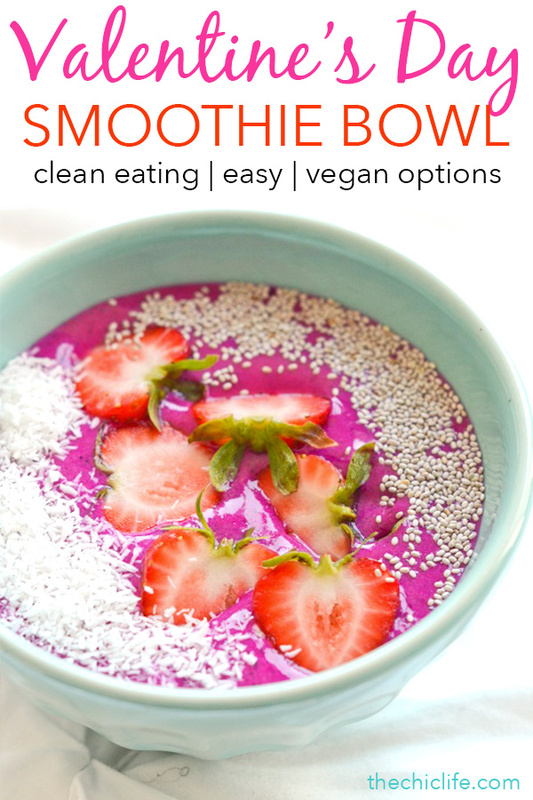 Hope you enjoy this Healthy Strawberry Pitaya Bowl Recipe. Thanks for reading!